We helped Landlink market their premier barn conversion homes with a property logo design that reflected the exclusive character of the Cheshire countryside development. Property developer Landlink were marketing a select development of exclusive ‘barn conversion’ style homes, set in the beautiful rural location of Kingsley, in the heart of the Cheshire countryside. The first part of our brief was to come up with a list of names which effectively reflected the charm, character and exclusive nature of the development. 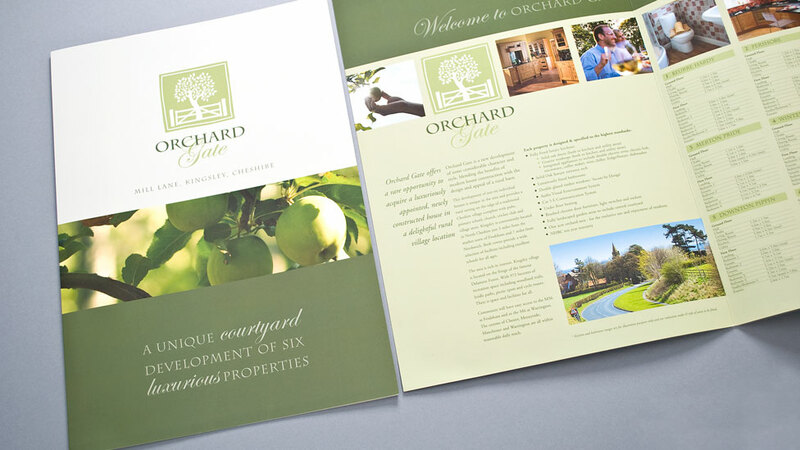 Working in close collaboration with our client, and ensuring the name would match the expectations of their audience, we agreed on the new name: Orchard Gate. We then set out to develop a sympathetic property logo design which we could roll out across a full suite of promotional marketing materials. Taking the name and the location as our inspiration, we created a simple yet stylish graphic illustration of an apple tree and gate. We combined a distinctive serif typeface with an ornate script face to give the logo a natural and rustic, yet elegant and modern look. The colour palette of dark and light olive greens ties in beautifully with the rural location and also helps achieve a suitably sophisticated logo design.